The IRS recently released data on individual income taxes in 2011. 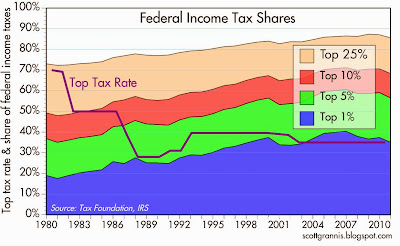 The Tax Foundation has nicely summarized the data, and I've put the some of the data into the charts below. The story hasn't changed: upper-income earners continue to pay a hugely disproportionate share of total income taxes, and our tax system remains highly progressive. In 2011, it took $389K or more of adjusted gross income to make it into the top 1% of income earners, and they paid 35% of all federal income taxes. The top 5% of income earners made at least $168K and paid almost 57% of all federal income taxes. The top 10% paid made at least $120K and paid 68%. The top 25% included all those making $70.5K or more, and they paid 86% of all federal income taxes. Meanwhile, the bottom 50% of income earners (those making $35K or less) paid only 3% of all federal income taxes, and the vast majority of them either paid no income tax or received money on net from the IRS. The Laffer Curve at work: Although the share of total income taxes paid by the top 10% of income earners today has fallen a bit in recent years, it has nevertheless risen by over 40% since the early 1980s, despite the fact that the top income tax rate has been cut in half. Slashing the top marginal rate by half resulted in a huge increase in the share of total income taxes paid by the rich. Instead of asking the rich to pay even more, we should be thinking about how everyone should pay at least something. Just paying your social security taxes doesn't count, because in theory—if not in practice, since the rich will undoubtedly subsidize the social security income of a great many people in the future when social security revenues fail to cover expenditures—that is money you will get back when you retire. Income taxes, in contrast, go into the general fund. 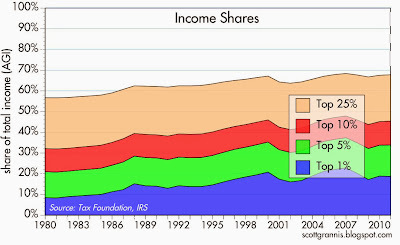 The chart below shows the share of total income (AGI) earned by each of the groups in the chart above. Not surprisingly, top income earners make a large share of total income. However, if you compare the two charts, you see that the share of total taxes they pay is much larger than the share of income they earn. Our tax code is very progressive no matter you look at it. In 2011, for example, the top 1% of income earners made 19% of the country's total adjusted gross income and paid 35% of total income taxes. The top 5% earned 34% of total income and paid 57% of total taxes. The top 10% earned 45% of total income and paid 68% of total taxes. The top 25% earned 68% of total income and paid 86% of total taxes. What's scary is when you think about this statement: "Almost half of those who work paid no federal income taxes. Is that fair?" How could someone work full time and not make enough to "qualify" to pay taxes? If you consider the biggest federal tax many people pay--FICA--the picture changes. I feel your pain, Scott. On the other hand, at the lower income levels, even if you raised the tax brackets enough to be noticeable, it wouldn't make much difference in the take. I'm surprised that we are closer to the rarefied atmosphere than the bottom, if these data are to be believed. We aren't living like we are rich. I drive an eighteen year old car, and my wife's car is eleven years old. I agree with your remark about the payroll tax. That is simply retirement income redistribution. It isn't helping the carry the deadweight of the government employee sector. I have often, facetiously, thought the tax brackets should be highest for the low income deciles and declining as one increases income. That way, everyone would be striving to increase his income, a desirable outcome, to reduce his tax bracket. @skydude: they have deductions, like children, which bring their adjusted gross income below the taxable rate or even qualify for support payments for the "working poor". Indeed, let's talk "fairness". In the Dec. 5 post, we learned that "after-tax corporate profits as a % of nominal GDP are very close to an all-time high on this basis, and significantly above where they have been over the past 55 years." Today's post tells us the top tax rate is far below where it was 30 yrs. ago. So why is it that so many workers who helped create those profits aren't being rewarded enough to BEGIN paying federal taxes? It sure can't be because top tax rates are too high, right? 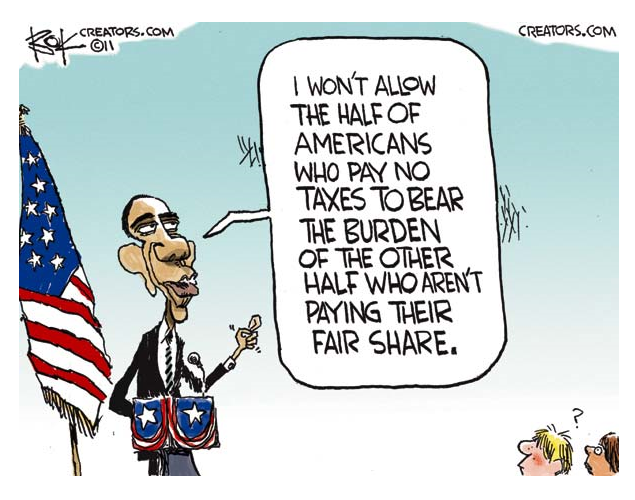 Just maybe the cause of the problem is to be found beyond government, and tax rates. And remember, it's about "fairness". Income taxes should be outlawed -- no one should be required to pay taxes on income. 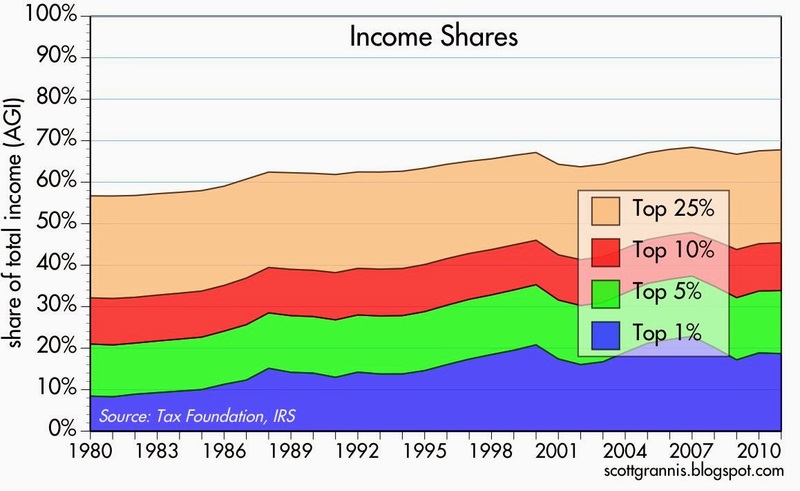 The declining share of taxes paid by bottom 50% is a symptom of growing wealth inequality from 1970's on. Real wages for many (especially those with only high school degrees or below) have not kept up with productivity growth, as a matter of fact. For the rich, things in general are getting better - even though they pay more in taxes, their income/wealth is increasing at proportionally greater rate. For them, it's just the cost of doing business to maintain the status quo, so it's really unreasonable to get misty over this particular 'misfortune' of the establishment. This is the most Bullish they have been in the two years I have been checking this poll. Interestingly, Lipper Fund Flows didn't publish their results this week. Last week the Bulls were 57% and the Bull / Bear Ratio was greater than 4.0 . Perhaps actions speak louder than words ~ Although market advisers and individuals indicate they are Bullish, their aggregate actions were to sell $13.3 Billion of equities in total. Almost half? If they know about the statistics, how come they are not taking action to make these half pay their taxes. That way, it will be really fair.